Check out confirmed details about Group B Teams, Schedule, Predictions for the FIFA 2018 World Cup to be held in Russia from 14th June. Certainly, one of the most difficult and interesting group. Serious spice in this group, with Spain taking on Portugal, the 2010 world cup winners against the reigning European champions. Moreover, Cristiano Ronaldo against half of his Real Madrid team-mates. The first Asian team Iran to qualify for the world cup also competing in this group makes the outcome somewhat unpredictable. African country Morocco came aboard after defeating Ivory Cost in the qualifying campaign. Playing in the competition for the seventh time, European champions Portugal is one of the contenders for the world title. Their best performance was in 1966 when they achieved third position. But they were eliminated in group stage in 2014 world cup. 2010 world champions Spain were stunned in the previous world cup when they were eliminated in the group stage only. Netherlands and Chile qualified from that group but both of these teams have not been able to qualify for the world cup this time. Iran has not advanced further group stage in its four appearances. 2014 being the recent, they were knocked out after being unable to win a single game. Playing in the world cup after 20 years, Morocco’s best performance was when they qualified for the round of 16 in 1986. It would be their total 5th appearance. Both Portugal and Spain are expected to clinch the top two spots. Both of these teams were able to finish at the first position in their groups without losing a single game. Portugal qualified having equal points as of Hungary and qualifying on goal difference where as Spain finished above Italy. Iran was the first Asian team to qualify and was undefeated throughout the qualifying campaign. But they still lack the skills to match the likes of La Roja (Spain) and Seleção (Portugal). Morocco overcame the challenge of might Ivory Coast in their qualifying campaign and remained undefeated. 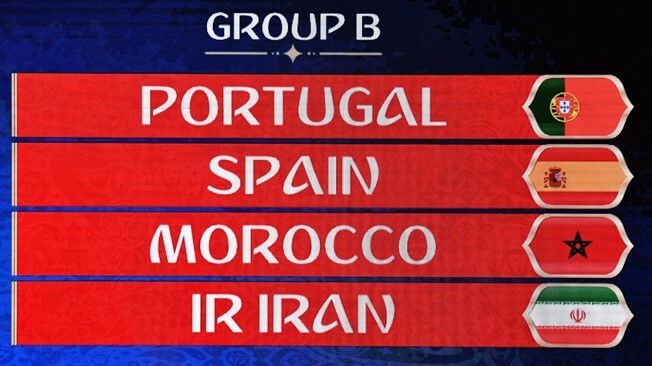 They are expected to finish third or fourth alongside Iran in the group stage. Also check Group A schedule, predictions details. Don't forget to watch 2018 world cup live streaming from June 14. FIFA World Cup 2018 Live streaming online will be shown on beIN Sports, Sony Ten, BBC, ITV in Uk and Fox Sports, NBC in USA.